The stories of poor customer services and the feeling of annoyance when needing to contact companies are seemingly endless. Therefore there is ample room for companies to offer superior services to compete for consumers’ tighter budgets and create loyal customers. The benefits of Papyrus WebArchive in consolidated customer services have been used by many customer-oriented organizations to improve their services. Banks use it to distribute statements and other customer documents and bank statements to branch of﻿fice servers to be collected by their customers. Insurance companies use WebArchive servers for access by internal and agent staff. Documents produced centrally are stored just as documents produced by the agent. Any customer query can be answered immediately. Customer documents can be printed, faxed or e-mailed as copy from the original document file. Telcos and utilities make billing information available for their staff and also for their customers over the Internet with hyperlinks enabling company staff to interact with host transactions via the document directly. And manufacturers and engineering firms provide any kind of document from technical drawings, parts catalogs and billing information for internal and worldwide access. The powerful WebArchive solution from ISIS Papyrus for short and long-term archiving and easy retrieval has now joined top perfomance for high-quality, on-the-go customer communications and response with the mobility and convenience of the iPhone. This recent development is part of the new strategy of ISIS Papyrus to support mobile applications and will be followed up by support for Windows Mobile 7 and Symbian. 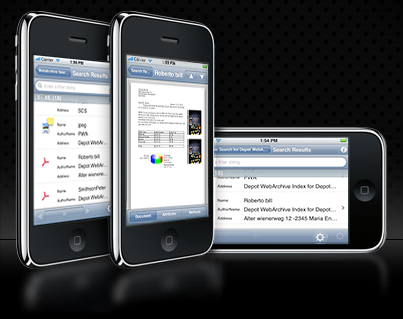 To find out how the WebArchive iPhone app can help you in fulfilling your organization’s strategic goals read a detailed description and a list of features here or get it at the Apple Appstore.